Most westerners (Americans, I am looking at you) will think of Singaporean Noodles as the thin, vermicelli-like noodles served in a generous portion of oil, mixed in with curry powder. Well, this may come as a surprise to many, but the Singapore-style noodles so common in most westernized Chinese eateries does not actually exist in Singapore! So today, I will look at the various types of noodles served in Singapore, and point out to you the best places to have them. No article on Singaporean food will be complete without a brief introduction to the story behind our local cuisine. Singapore is an immigrant society, and our forefathers came from all over Asia to find a living in Singapore. Many Chinese southerners traveled in Chinese junks across the South China Sea to come to Singapore to escape the harsh and intolerable conditions back at home. They brought along their traditional Southern Chinese flair. Indians, on the other hand, came mostly in 3 batches. The first batch comprised of the Indian administrators and soldiers the British brought along from British India to help govern Singapore. The second batch was the convicts the British brought along from India to relieve overcrowded Indian jails, and to serve as labor. Finally, the last batch comprised of Indians looking for a brighter future in Singapore. They might be well-educated English speaking elites, or poor, single Indian man looking for opportunities in this Straits Settlement. Therefore, the Indians brought along with them a variety of dishes from all over India, stretching all social-economic stratus. Finally, the Malays also had a great variety of dishes that was born out out the booming spice trade that occurred in the region. Before we talk about the different types of noodle dishes, we will have to talk of the different types of noodles. Just like how there are different varieties of pasta (ie. Fusilli, Penne etc), there are also different types of noodles. 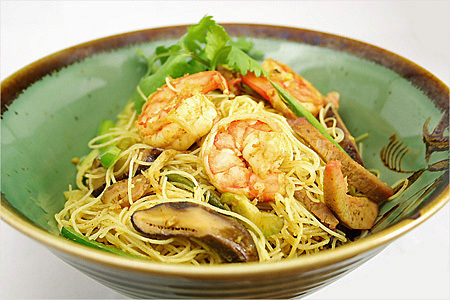 Origin: This noodle variety originated from Southern China, in the Hokkien, Teochew and Cantonese regions. Due to a lack of wheat (the basic ingredient from most noodles, including pasta and ramen), the ingenious southerners used rice to make noodles instead. Description: What marks this thin, hair-like noodle different from all others is its hard and non-absorptive quality. One can almost describe it as brittle, and the noodle breaks immediately upon chewing. Furthermore, the taste of rice is also very strong. Origin: Similar to the Thin Bee Hoon, the Thick Bee Hoon also originated from Southern China, and is made of rice. Description: Thick, bouncy, breaks easily in your mouth, this is the jelly of the noodle world. This type of noodle is notoriously non-absorptive, so no matter what broth you cook it in, it will still retain its rice taste. Origin: Commonly found in overseas Chinese communities such as Singapore, Malaysia and Hong Kong, the Lao Shu Fen has its origins in the Southern Chinese cuisine. It is made of rice flour and corn starch. 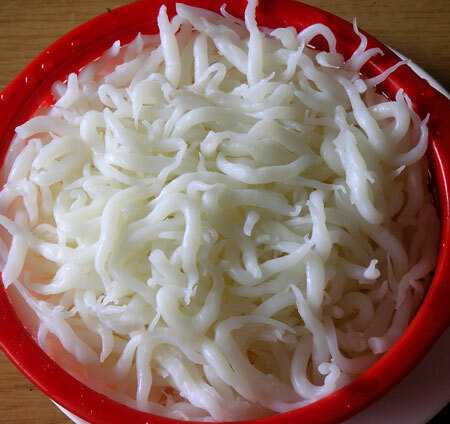 Description: White, round and short, this type of noodle is named as the Rat Noodle as it looks like the tail of a rat. The Lao Shu Fen is slightly more sticky and softer than the other rice flour noodles, and has a sweet taste to it. 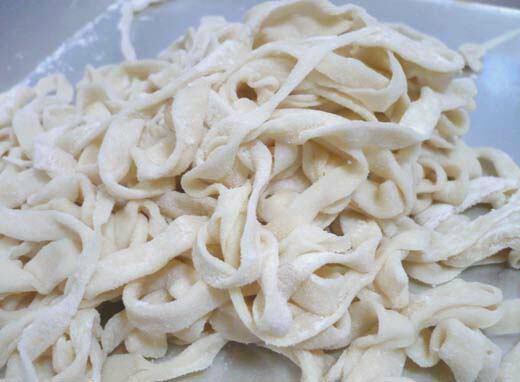 Origin: This noodle variety was born in the town of Sha He in Guangdong (Canton). It is made from thin slices of rice cake. 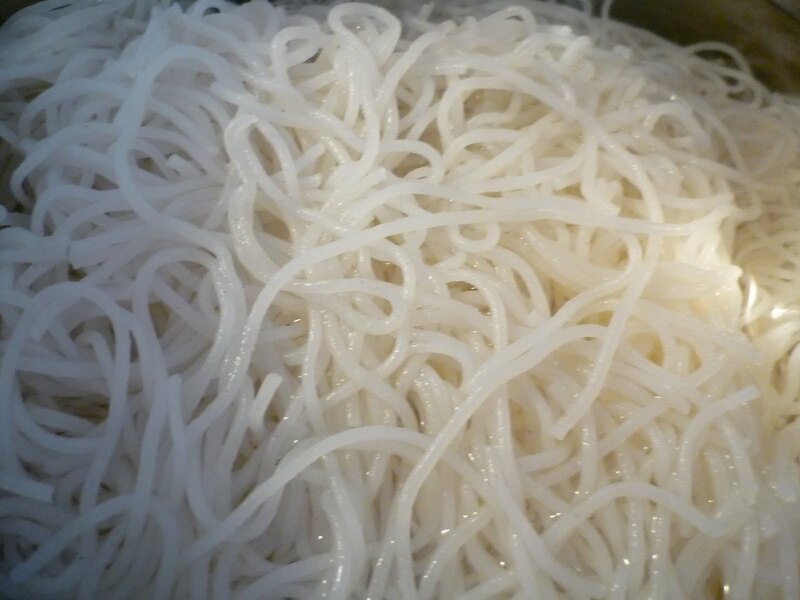 Description: Ho Fun is a rather chewy and sweet variation of the rice noodles. It comes in long strips of noodles of about 1cm wide. Origin: The Glass Cellophane noodle is a ubiquitous presence in most Asian cuisines, ranging from Northern Chinese to Korea and Cambodia. This noodle is made from green bean. 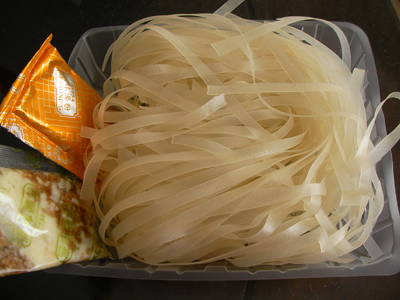 Description: Long, thin and transparent, the Cellophane Noodle is very chewy and firm. They don’t turn soggy even when cooked for prolonged durations. Origin: Northern China. (Wheat does not grow readily in Southern China ie. Guangdong, Fujian, Chaozhou – where the bulk of Singaporean Chinese came from)This wheat noodle has a long history, tracing all the way back to the 1500s. This characteristic Asian noodle has even made its way into Japanese cuisine. It is made through stretching dough into thin strands. 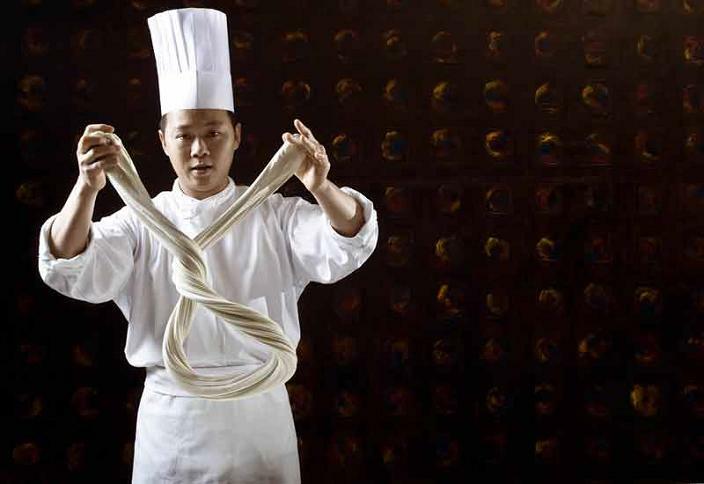 Lamian making is an art form, and is delightful to watch. However, authentic La Mian cannot be found in the local hawker flair as it is a Northern Chinese variety, and the majority of the Singaporean hawkers are Southerners. Description: Firm, but not too hard, stretchy, but not too sticky, the La Mian is the Holy Grail of all noodles. It is absorptive when cooked in soup, and will soak up the flavor of the broth that it is cooked in. Origin: This noodle originated from the Hokkien (Fujian) region of China, and has traveled to other regions like Taiwan and Singapore. This thin noodle is made of wheat flour. 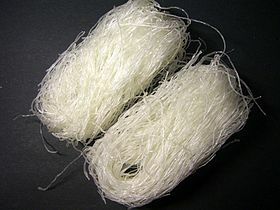 Description: What differentiates this white and thin noodle from the Bee Hoon (Rice Vermicelli) is its softness and its absorptive quality. 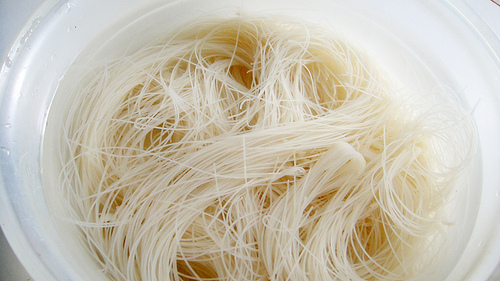 While the Bee Hoon can be described to be Jelly-like, the Misua is much more supple and less brittle. If you cook the Misua for a long time, or if you leave the noodles in the broth for too long, the noodles will literally dissolve the broth. Origin: Northern China. Ban Mian is a recent addition to the Singapore culinary scene. As the older generations of Singaporeans are all Southerners, the Ban Mian was not on their menu. The new wave immigrants from mainland China (especially Northern China) has brought along this delicious noodle variety. Ban Mian stalls are springing up all over Singapore, in hawker centers, as well as in restaurants. 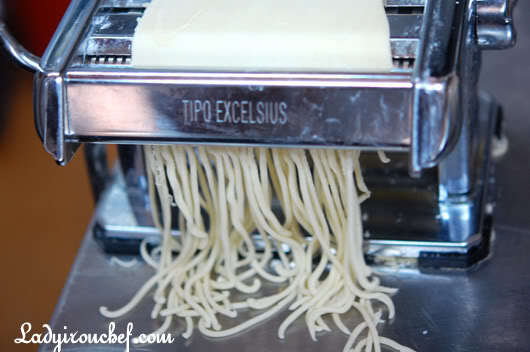 Description: This wheat based noodle is made from slicing dough into long, flat, thin slices. 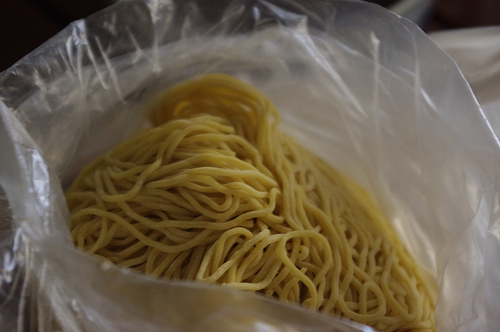 It is chewy and highly absorptive, very much like the Lamian. Origin: Southern China. This thin white noodle is made from wheat dough and egg. Description: The You Mian is very similar to its cousin, the Lamian in terms of its taste and its absorptiveness. However, the You Mian differs from the Lamian in its stretchiness and its chewiness. As the You Mian is mostly machine produced (unlike the La Mian), it can be less chewy and stretchy than the La Mian. 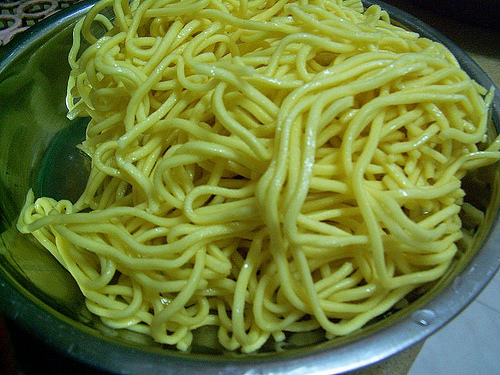 Description: Chewy, firm and springy, the yellow noodle is ubiquitous in Singaporean cuisine, appearing in both Chinese and Malay cuisines. However, one may find the flavor of Lye overpowering, and may experience a bitter aftertaste. Origin: Teochew. This wheat noodle is made with the addition of Lye Water (NaOH) and egg, which gives it its smooth and rich flavor. Description: Flat, oily, and chewy, the Mee Pok is rich in flavor and can be served both dry, and with soup. 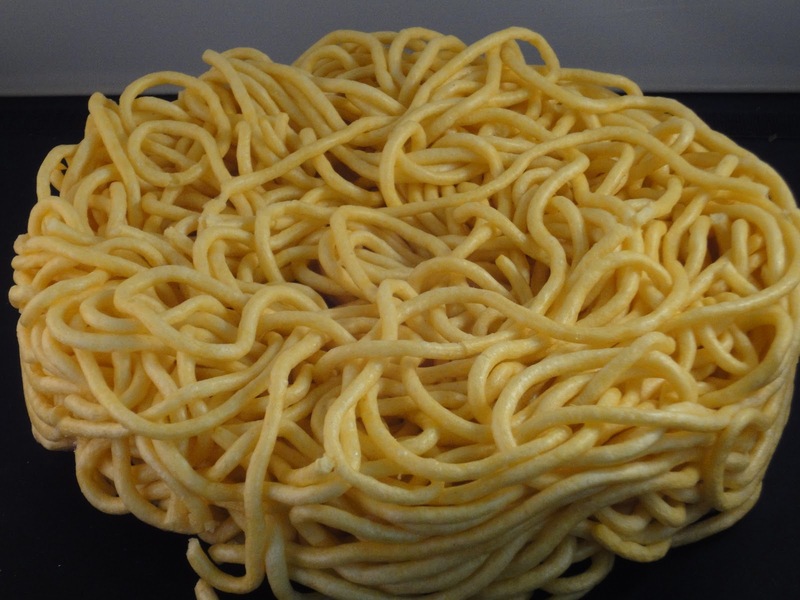 Origin: Yi Mian is a Cantonese noodle variety made from deep fried wheat flour and eggs. The yellow texture is due to the addition of Lye (NaOH). Description: The Yi Mian is distinct from all other noodle type as it most resembles the Instant Noodle. It is very hard (as it is deep fried) and spongy (due to the addition of carbonated water during the manufacturing process), and can be very chewy. The frying process also gives it an oily and slightly crispy taste. Description: This wheat based noodle is mixed with Lye water to give it its chewy quality, and contain eggs, which gives it its rich and slightly oily flavor. The Mee Kia is highly similar to the Mee Pok, although the Mee Kia is much thinner than the Mee Pok. Watch out for Part 2 where I will write about the various Singaporean noodle dishes that can be made from the above introduced noodle types. Good 1st part, looking forward to the 2nd.